There is nothing more satisfying than finishing a project that has been languishing on the needles for, oh, the better part of two years. 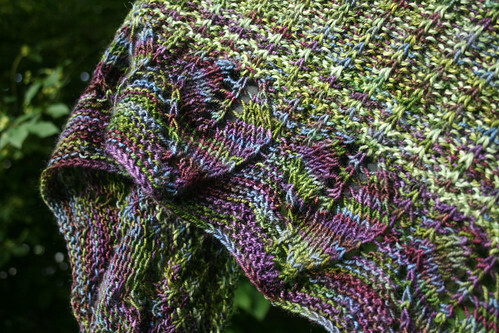 I remember seeing my pal Juliefrick's test knit version at MDS&W right after the pattern had been released in 09 and NEEDING to cast on immediately. 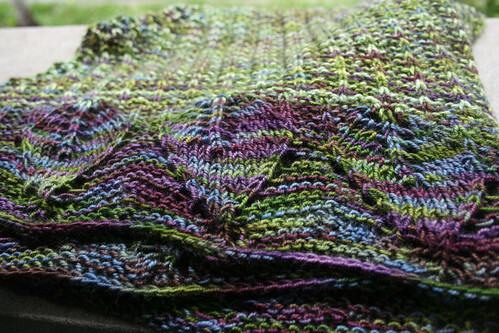 Luckily I was in line at The Fold's booth at the time and was able to instagratibuy the yarn for it. That day I couldn't race home fast enough to fire it up. And here we are, two years and many breaks later, and it's finally finished. Whew! 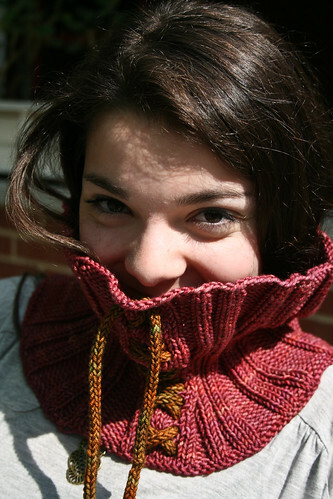 Pattern Ulmus by Kirsten Kapur of Through the Loops. Yarn: STR Mediumweight in 'Puck's Mischief'(entire skein) and STR Silkie in 'Jade' (.75 of skein). Modifications: Was forced to omit last two rows due to lack of yarn! If you look through the Ravelry project gallery you will note that many knitters did what I did: put it down for a spell, pick it up again and have completely lost your place. Hilarious! Luckily I knew I'd be seeing the designer herself at last year's Maryland Sheep and Wool for a chat, so I brought it with me and she was kind enough to look at it and within several nanoseconds identify where I was. Love her! Those of you who know my strict personal guidelines regarding mixing lace and variegated yarn are perhaps surprised to see that I have done the lace portion as I did--yes? Well believe me I only did so after great deliberation and trolling of the project gallery into the wee hours of the morning. 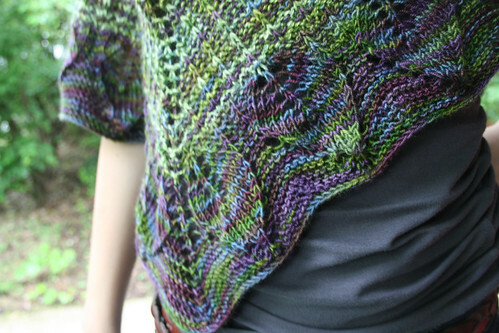 I noticed that many knitters had in fact used a variegated yarn for the lace pattern and it, in fact, looked quite nice. So I gave it a whirl and am so glad that I did. At this year's MDS&W I once again saw my pal Juliefrick as was reminded of that morning two years ago when I became crazed for that pattern. This year it seems to be all about stripes: both Dream Stripes and Different Lines (the shawl pattern created by Veera Välimäki to satiate all of you Stripe-Study maniacs) will be accompanying me on my trip tomorrow. See you on the flipside! If there is one thing I'm basically always game for, it's a good ol' KAL. To me there is nothing more fun than doing a project at the same time as a bunch of other knitters because you guarantee that you'll have an instant cadre of people who can help you out when you stumble or hesitate. And you're there as well to give advice and cheer your KAL pals along. It's a win-win scenario! I just love Larissa's patterns. I used the word 'offbeat' to describe them on Ravelry...and it seems so apt. She is the queen of likable patterns that have just enough of an odd little twist that make them thoroughly hers. 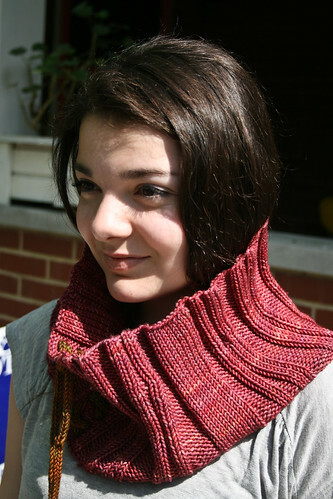 This cowl firmly cements my love for her because it is so darn versatile as you can wear it a myriad of ways: over the shoulders, loose around the neck, cinched up with the iCord. You name it! This pattern is quite appropriately named, as we have just rediscovered the joys of the French Press coffee maker around these parts. Not quite sure why I ever started using the drip maker--convenience perhaps? In any case, something possessed me to break out my French Press pot a few weeks ago and WOW it's like it's not even the same beverage. Yes it takes longer, but if I don't have time to drink coffee the way is was meant to be consumed, then what's the point? I have been busily knitting away on several projects that I need to finish before I leave for France next week. Yes, I'm off for two weeks to supervise a study abroad trip. Yeah.... Ahem. You know the drill: manically finish a few WIPs so I can spend loads and loads of time deliberating about what the perfect travel project might be. Any suggestions?